How to Get Past Fear and Achieve your Goals - iCatalyze - Seeks to catalyze your potential! We’ve all been there at some point: looking up at what seems like a towering mountain looming over us, causing panic and fear. It occurs when we are advancing toward a new goal or project and we don’t know where to begin, feeling overwhelmed and paralyzed by fear. I see this time and time again with my coaching clients, no matter what size the undertaking. Many times, when we are trying to make a change, we need to address the hidden obstacles that thwart our progress. Obstacles can be practical, external factors such as time and money; or internal barriers such as fears, beliefs or needs. Throughout many conversations and experiences, I’ve identified a few steps that can help you scale this mountain and get to the other side, making progress toward your goal. First: Name it. Own it. Then move on! 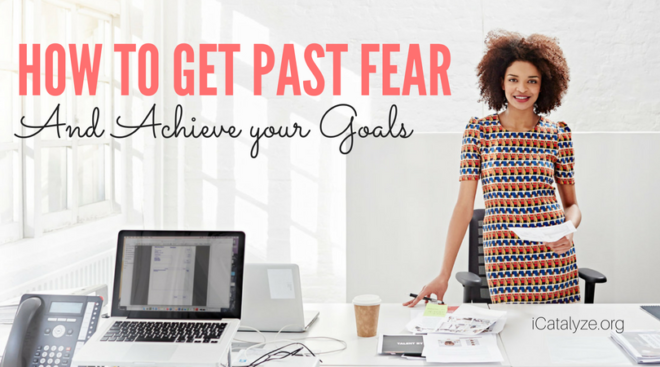 The first thing we have to do is acknowledge the fact that we’re scared or overwhelmed. It’s ok! We’re all human and we all face these challenges when endeavoring into the unknown because it is just that: unknown. We naturally strive toward safety and equilibrium, which we currently have within our comfort zone. But in order to grow as individuals, we must venture into a state of “productive discomfort” as my own coach, Rae Ringel, used to say, and reach outside of our comfort zone. Internal obstacles have the most power over us when they live in the darkness, unexamined and not understood. But, when we bring them out into the light, name them and talk about them with others, they can lose much of their power over us. So, it is important to have some self-compassion and give yourself a break because it is normal to have feelings of anxiety or fear as you face a new challenge or work toward a new goal. Don’t judge yourself. Yes, you are nervous, but NO, you are not going to let that stop you! Can you name what you’re afraid of? What’s the thing you don’t want to happen? What do you need that you don’t have to reach your objective? What would you lose that is important to you if you did change? What’s your worst-case scenario? What’s the fear behind that? What belief is behind your responses? How well is that belief serving you? When you’re facing a daunting task, the best thing you can do is break it down into smaller parts and take it step by step. When you have small victories to get you closer to goal, you can celebrate along the way which will motivate you. I completely agree with their mantra of “Don’t get ready, get started!” because we can get so caught up in the planning phase and it can easily become an excuse and procrastination to actually get started toward our goal. The more you ruminate about what you need to do, the less you will get done. So, after you break it down into smaller pieces, start tackling the small steps and checking them off your list. I find myself in a similar situation these days as I am developing a new product for iCatalyze, and I’ve adopted the strategy to make myself complete one concrete action each day. I am getting closer to being ready to launch this product and can see the progress which motivates me to keep going! This step I am borrowing from the Design Thinking methodology, whereby you can apply design techniques to solve real-world problems. As you make progress toward your goal, you should take a break periodically to review what you’ve done, and make adjustments to improve as you go. Our first plan will never be the way things actually play out. Acknowledge how you’re feeling, and understand what these emotions are informing you. Name the emotions and don’t let them paralyze you. Break down your goal into smaller achievable parts to help you make progress step by step toward your objective. Just do it! And take concrete action. Evaluate and make improvements as you go along. While you might be looking up at what seems like a mountain, by stepping outside of your comfort zone and making progress toward your goal, I am sure you will find a better version of yourself on the other side!